As promised, bloggy peeps! Finally some decent photos to go with my rambling. 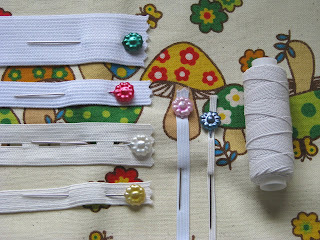 This month's tips are on elastics and elastic hems to be exact. By elastic hems, I'm referring to waists, cuffs and the necklines on the ubiquitous peasant-style tops. First of all, you'll find various kinds of elastics in the haberdashery section of your local fabric shop. If your favourite fabric shop is also a garment fabric shop, then I can guarantee they'll have have an even bigger selection than what I've got on hand here. Elastics come in different widths, with wider types I'd recommend for waists bands while the narrower kinds are more suited to sleeve cuffs, peasant-style neck lines and shoulder edges. The narrowest one I'm showing you (closest to the spool) I've heard referred to as hat elastic and can also be used in sleeve cuffs. The spool is shirring elastic. 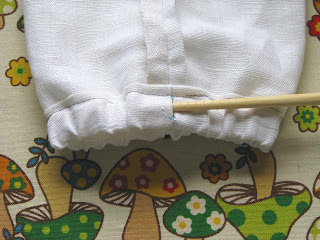 There's an excellent how-to on the use of shirring elastic at house on hill road via her summer dress tutorial. But for this post, I'm going back to basics....how I make a casing and insert the elastic in the casing. From observation of various books, this seems to be one of the bits of sewing lore that a lot of books and patterns take as assumed knowledge. So, here we go. 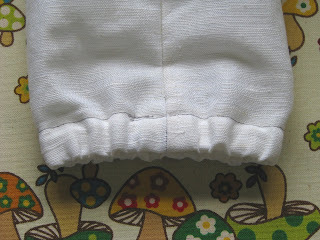 If this was a pair of trousers, mark the elastic width on the fabric before sewing the side seam (either one, since there's two side seams in a pair of trousers). Make sure you leave enough room for the double folding of the casing. 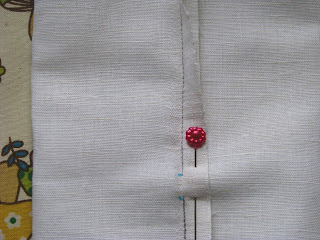 Stitch your side seam, taking care to leave a gap where you've put the marks. This is the gap where you'll be inserting the elastic. Open the seam and iron flat. 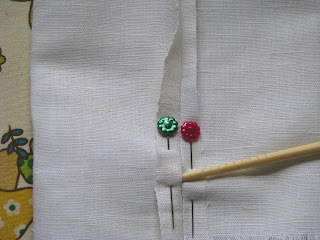 Where I've got the chopstick into the stitched seam is the hole you'll be using to insert the elastic. Fold the edge towards the wrong side twice and press. 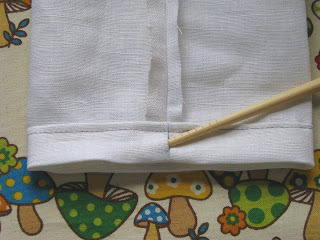 Make sure that the elastic insertion point is square in the middle of the fold. 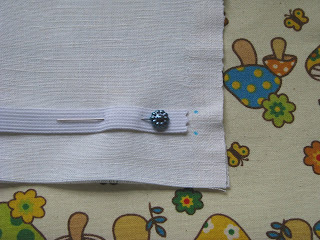 Pin and stitch......and voila, you've got your casing. 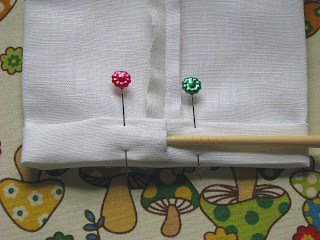 Next attach a safety pin to one end of your elastic, like so. 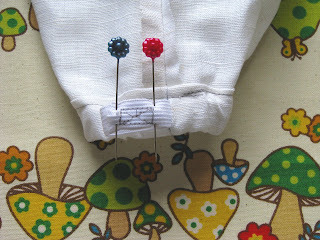 Make sure your safety pin is the kind that doesn't undo itself easily, otherwise you're stuffed! Insert the pin into the casing via the stitch hole you've created and gripping the pin head, thread it through the entire casing. Until you get to the other end. Be careful not to twist the elastic while threading. Take off the safety pin and sew the overlapped the ends. I always use the "crossed box" pattern to ensure the stitches don't undo themselves whilst they're in wear. You can hand-sew or machine-sew this part. Push the sewn ends back into the casing. Turn over and admire your handiwork. See! Easy peasy! Hope that was clear as mud to you all.....and if you have any questions, just shoot them in the comments. I'll post questions and answers as an edit to all "sewing tips" posts, so that everyone can share in the info. Okeydokes! Back to more sewing for me. Wow - thank you for the time you've taken to let us beginners learn some new skills! Nice one Jade - easy to see and understand! I will make sure our patterns include the basics. Maybe you could be a pattern tester?? oh my you made it look so simple!! thank you so much, this will be super useful. Thank you so much for this! 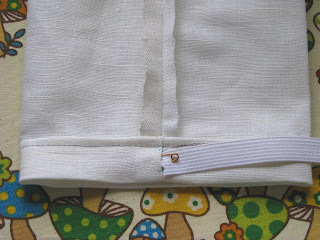 I have used elastic before but I never thought to insert it at the seam! Thank you for teaching me the right way! What a fantastic tutorial - thank you! I love your flower pins too. Great tutorial Jade - thank you! Thanks! 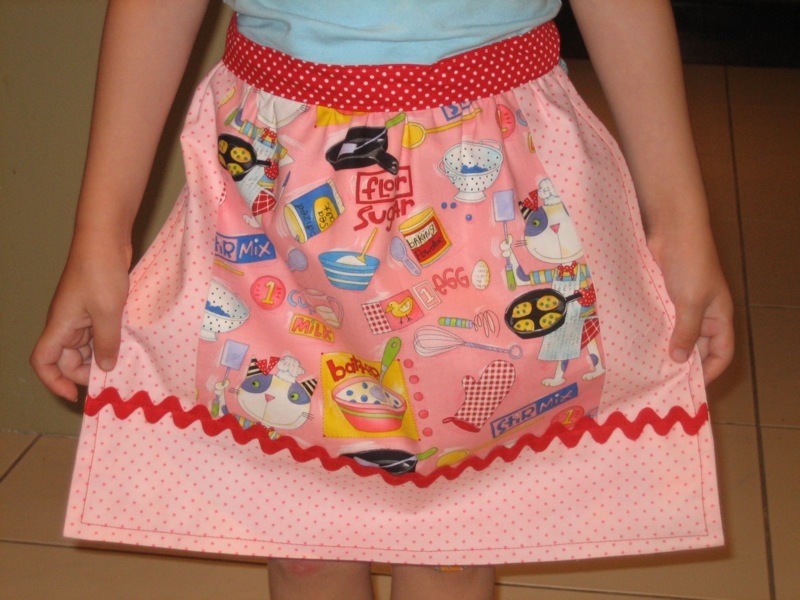 I have put off making pants and bloomers with elastic in the bottom, but I think I could give it a go now! Oh Jade you're so neat ... you put me to shame! Great work! Excellent Jade! You cracked me up with the bit about the pin opening -- I've had that happen a time or two and it's very unpleasant. 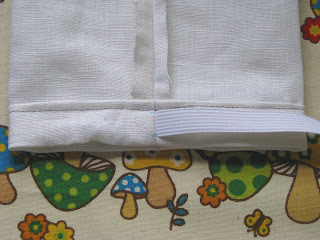 I like your method of leaving a little bit open in the seam -- I've always used the method where you leave a gap in the stitching of the casing and then, after the elastic has been inserted, you stitch that little casing closed. You way will appear much neater from the right side! Thanks for a great tutorial! great advice, Jade. Well done. Very simple and easy advice that works. That's a great tutorial, thank you! The photos are so clear. I have always been too slapdash to leave the whole in the sideseam, I just leave a gap in the casing when I sew it down, but your way is much tidier... I'm will try it next time. Thanks so much for the first handy sewing tip Jade. I look forward to more of them. Fabulous tutorial. How neat and tidy is that casing! Wow. Do you have any examples of how that type of cuff would look on an outfit? I am probably asking too much but thought I'd ask. Rather nice place you've got here. Thanks the author for it. I like such themes and everything that is connected to them. I definitely want to read more on that blog soon. Thank you so much for this! I was just making my first clothing piece that involved elastic, and that part was baffling me. I googled, found your site, and am grateful for the clear explanation. 5 minutes later, and my project was done! Hi I thought you might find this tip helpful. 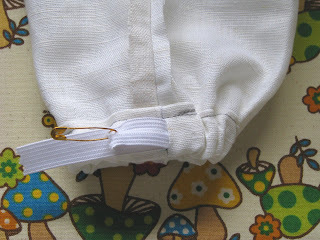 To stop the safety pin coming undone while your inserting elastic in the casing wrap some sticky tape around it. Snip the tape off once you have got the elastic inserrted. This tutorial is great! It leaves such a neat and clean finish. I absolutely love the mushroom fabric that you used as a backdrop! Do you happen to know the name of it or where I can purchase some?